This book explores the full range of technologies, protocols, and techniques necessary for building successful e-commerce sites. The authors begin with an overview of the Internet and the Web, then quickly move on to explain server-side programming techniques, cryptography and Internet security, and how to take advantage of leading-edge technologies such as mobile agents, WAP, XML, and data mining tools. Placing this technical know-how in business context, the authors then walk readers through actual e-commerce applications, from Internet payment systems to Web advertising and publishing. A running case study depicting a Virtual Book Store (VBS), step-by-step programming exercises, and real-world examples round out this highly practical, easily accessible guide. Henry Chan is the author of E-Commerce: Fundamentals and Applications, published by Wiley. 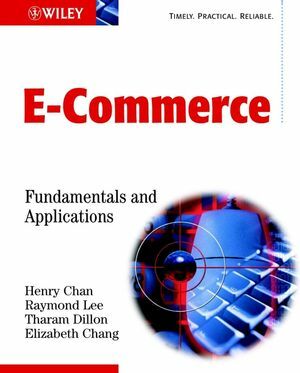 Raymond Lee is the author of E-Commerce: Fundamentals and Applications, published by Wiley. Tharam Dillon is the author of E-Commerce: Fundamentals and Applications, published by Wiley. Elizabeth Chang is the author of E-Commerce: Fundamentals and Applications, published by Wiley. Server-side programming I: servlet fundamentals. Server-side programming II: database connectivity. Server-side programming III: session tracking. Basic cryptography for enabling e-commerce. Web advertising and web publishing. Step-by-Step Exercises for Building the VBS. Covers technologies and applications in an accessible and easy-to-read manner. Covers key underlying technologies and advanced technologies.